Debut author Sheldon Siegel bursts into the legal thriller arena with a riveting courtroom drama, exposing the world of big-time law firms and lawyers in a fresh, sharp-witted, wonderfully sardonic page-turner. Meet Mike Daley. Ex-priest. Ex–public defender. And as of yesterday, ex-partner in one of San Francisco's most prominent law firms. Today he's out on his own, setting up practice on the wrong side of town. Then his best friend and former colleague is charged with a brutal double murder, and Daley is instantly catapulted into a high-profile investigation involving the prestigious law firm that just booted him. As he prepares his case, Daley uncovers the firm's dirtiest secrets. It doesn't take long for him to discover that in this trial, ambition, friendship, greed, and long-standing grudges will play just as important a role as truth and justice. 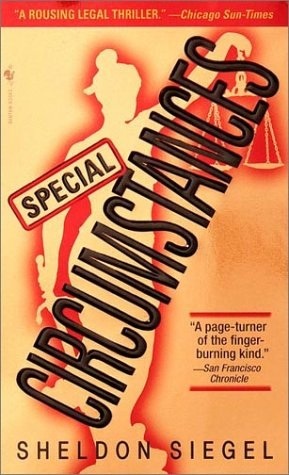 Brilliantly paced, crackling with energy and suspense, Special Circumstances reminds us why we love to hate lawyers — but can't get enough of courtroom drama when it's done this well.